I always advocate that a sauce can be the star of any good meal. Just give my Simple Arrabbiata Sauce a try and you’ll understand. Making this crema is dead simple and will be especially easy to make if you have a high speed blender or food processor. Any excuse to use my high speed blender is a good excuse to me! 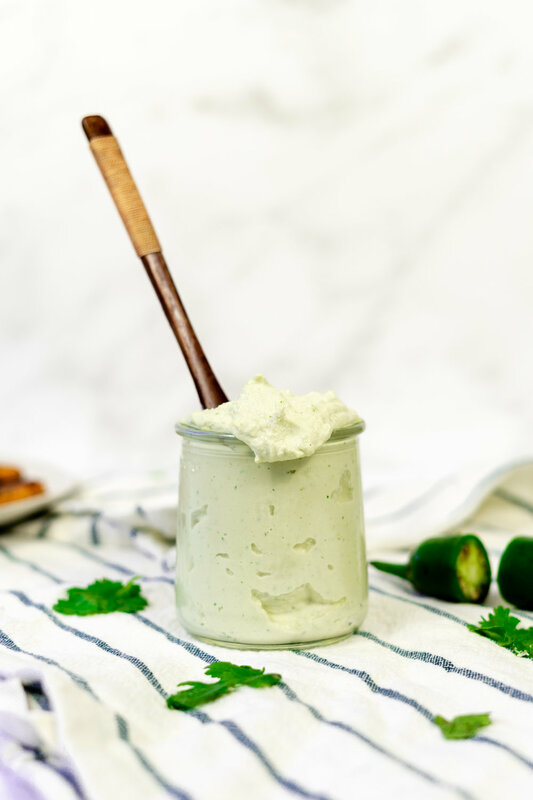 Using just cashews, jalapenos, cilantro, lemon juice, pinch of salt, and water, you can make a deliciously creamy sauce perfect for dips or spreads, as well. The inspiration for this recipe came to me after eating a particularly spicy Chipotle burrito bowl recently and wishing I could have some cheese or sour cream to calm the fire in my mouth. Despite the jalapenos, this sauce is not overly spicy. The jalapenos add a natural kick but won’t overpower or conflict with a pre-existing spice. I recommend pairing this with a Mexican-inspired salad, your own burrito bowls, tacos, or anything savory. I’ve put this on my Hazelnut Chorizo Tacos to help combat the natural heat from the chorizo. Pro tip that's really just a good tip: wash your hands after slicing the jalapenos! This may be obvious to you but it was not to me. It was only obvious after I’d finished the recipe, while taking my contacts out and spreading spicy jalapeno particles all over my eyeball. Don’t make the same mistake - it was The Worst. Another important tip is to not over soak your cashews. Letting them soak over night or while you’re at work is fine, but any amount of time past 10 hours will cause the cashews to lose their flavor. The flavor of cashews isn’t very present in the final result, anyways, but you don’t want them to develop an unsavory taste, either. Combine the cashews, lemon juice, salt, jalapeno, cilantro, and 2 tbsp of the water to a high speed blender or food processor. Blend/process on high until the cashews are mostly chopped. Push down the mixture that has sprayed on the sides of the blender with a spatula. Blend on high again but this time add and additional 2 tbsp of water while the mixture is processing. Continue this step, pushing down the sides and adding water as necessary until you reach your desired consistency. To save, put in a sealable container and refrigerate. This will keep for up to one week after making.